The real reason for the Christmas season is celebrating the birth of Jesus! He can get a bit overshadowed by Santa and all the other holiday festivities. Bring him back to the centered by having a Christ-centered Christmas for your family, and especially for your kids. It can help you to re-focus on the true meaning for the season as well! 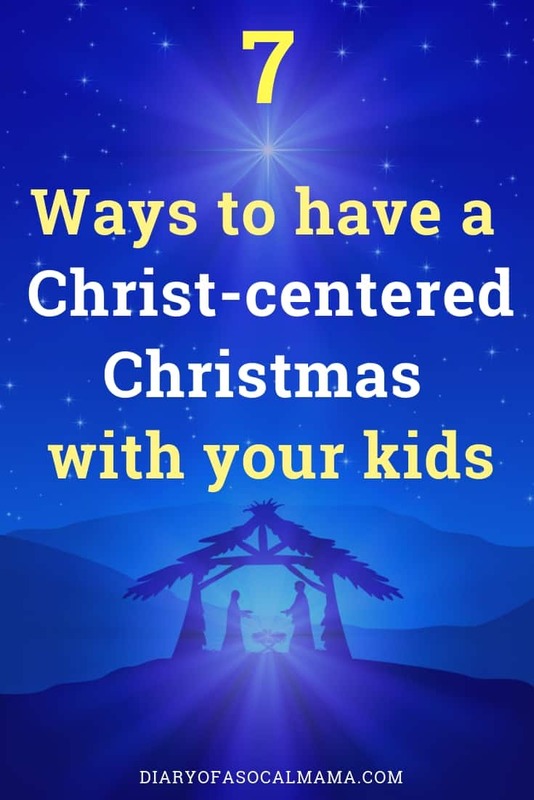 Here are 7 ideas to help your family have a Christ centered Christmas and celebrate Jesus Christ at Christmas this year. Something would seem amiss if you had a birthday with no cake, right? Why would Jesus’s birthday be any different? Try this amazing tradition this year. Involve the kids in the baking and in the decorations. You can then sing happy birthday to Jesus and later on gather around and sing the Christmas carols. Dedicate the day to Him. 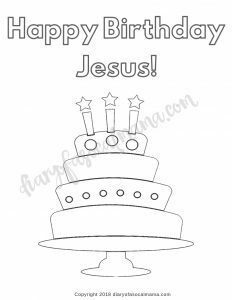 If you aren’t into actually baking print out this fun Happy Birthday Jesus coloring sheet! I know that it might seem weird because you have no address to send the letter to but it could be a great family tradition on Christmas. We all have a lot to thank the Lord for and putting it in a letter could help. Let the family members write about what they are grateful for and put these letters in a box somewhere. Years later, you will feel great reading through these letters. It’s a great activity that the family can do together. Go shopping for gifts for toys for tots, no one buys anything for themselves on this trip! Whatever you choose to do, do it as a family and discuss with your kids the importance of giving back. Talk about how good it feels and how happy you made the people you blessed. A nativity is a great way to bring the story of Jesus birth to life for kids. Little People even makes a special nativity set so even the youngest members of your family can get involved without risking your nice nativity set getting broken. While she plays with the set we talk about the different people and why they are special. You can find similar nativity playsets if the Little People one is all sold out. Pull along some friends and family members and attend the Christmas Eve service. Try to convince those who have never attended to attend the service. In this service, people are taught the true meaning of Christmas and why they should appreciate that Jesus was born on this day. It would also be a great time to socialize with other people in the community. If you don’t have an established church look up a local one or ask your Facebook friends for a recommendation. Many of these services are also family friendly and the whole family can attend together instead of sending kids off to kids ministry. It can be a great bonding moment. Even though I wasn’t much of a Christian growing up I still looked forward to attending the Christmas Eve services with my family every year and the candlelight singing at the end. There are 24 chapters in the Book of Luke in the Bible. This includes what we know as the Christmas story. Read one chapter each night leading up to Christmas. You may want to condense it down to just a few verses for younger kids. Make sure you’re reading a day ahead so you know what’s coming up and how to condense it if necessary. You only have to be one day ahead to help teach others about the word of God. I wish I could remember where I heard that great truth! 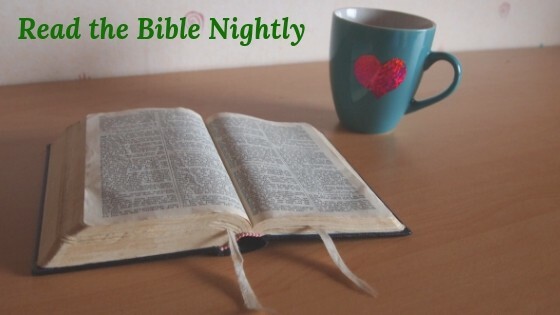 This practice can also help you get in the routine of reading the Bible each night, something many of us have trouble fitting into our day. After doing it for 24 days hopefully it’s a routine you can continue with other books in the Bible once Christmas is over. After all, Christ should be a focus in your home all year long, not just at Christmas time! If you don’t have a bible you can download the Bible app on your phone to have it easily accessible. There’s no rule that you can’t have Jesus as well as other secular figures like Santa, Frosty, and Reindeer. Just make sure Jesus is the star of the show. Don’t let him get outshined by these other figures that are fun but not the real meaning of the season. Carefully select the events you attend, the books you read, and the crafts you make to ensure more of these are Christ-centered and celebrate Jesus than those that celebrate other holiday figures. 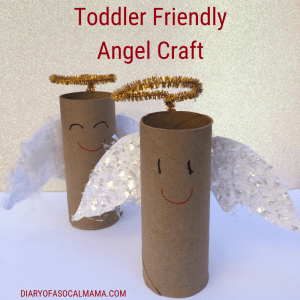 Try these easy toilet paper rolls angels that are a simple craft activity for home or church. If you need a laugh you can all watch this fun Christmas story as told by kids! See how your kids would tell the story.